I love breakfast! It's one of my favourite meals, despite how habitual and boring it can get at times. I'm also one of those people who can't skip it without risking a mid-morning meltdown - like a car running on empty, I don't function well. Not everyone is the same though - whether just not hungry or the snooze button is a little too tempting, some dash out the door without a crumb passing their lips. It's indeed important to eat to our hunger cues, although whether you're a breakfast eater or not, a healthy morning meal does carry benefits, and as the name implies, will "break" the "fast" from overnight. When we start our day properly nourished it can make a big difference to our energy, concentration, memory and mood, fueling us up both mentally and physically for the day ahead. It can also help us make healthier food choices later in the day - when we skip breakfast we may be more likely to overeat at our next meal or be tempted to eat whatever's in sight when we start to feel ravenous later. Carbohydrates, proteins and fats are known as macronutrients, which are nutrients we need in larger amounts for good health - all foods can be loosely divided into one of these three groups, based on the similar nutrients they contain. When building a healthy balanced breakfast aim to include each macronutrient on your plate, or in your glass - that is, a protein-rich food (e.g. eggs, tinned fish, beans, protein powder), a fat-rich food (e.g. avocado, chia seeds, nut butter) and a carbohydrate-rich food (e.g. fruit, oats, quality bread). By including each, your breakfast will supply you with differing nutrients and help prevent blood sugar levels spikes, which is key for sustained energy levels and appetite regulation. Unlike protein and fats, carbohydrates have a big influence on our blood sugar levels, which can affect everything from our appetite regulation, to our food cravings, to our energy levels. When digested and absorbed carbohydrates break down into sugars in the body, and rate at which this happens will be determined by not only the kind of carbohydrate, but also what they’re eaten with. "Complex" carbs (e.g. oats) are broken down slowly and supply us with a steady release of energy - think slow-burning logs on a fire. Whereas, more refined processed options (e.g. sugary cereal), which often contain excess added sugars, are digested and absorbed quickly, which can cause spikes and crashes in our energy levels (and often cravings for more sugar and carbs) - think fast-burning petrol on a flame. Complex carbs are the way to go for more steady energy levels, as well as always ensuring to include a protein and fat at your breakfast - these are digested slowly, and will help keep you feeling fuller for longer. There can certainly be a tendency to think breakfast needs to be made up of "breakfast" foods, such as cereals and toast. This isn't true - breakfast can be made up of any foods, the only real difference between it and the other main meals is typically the time available to prepare it. 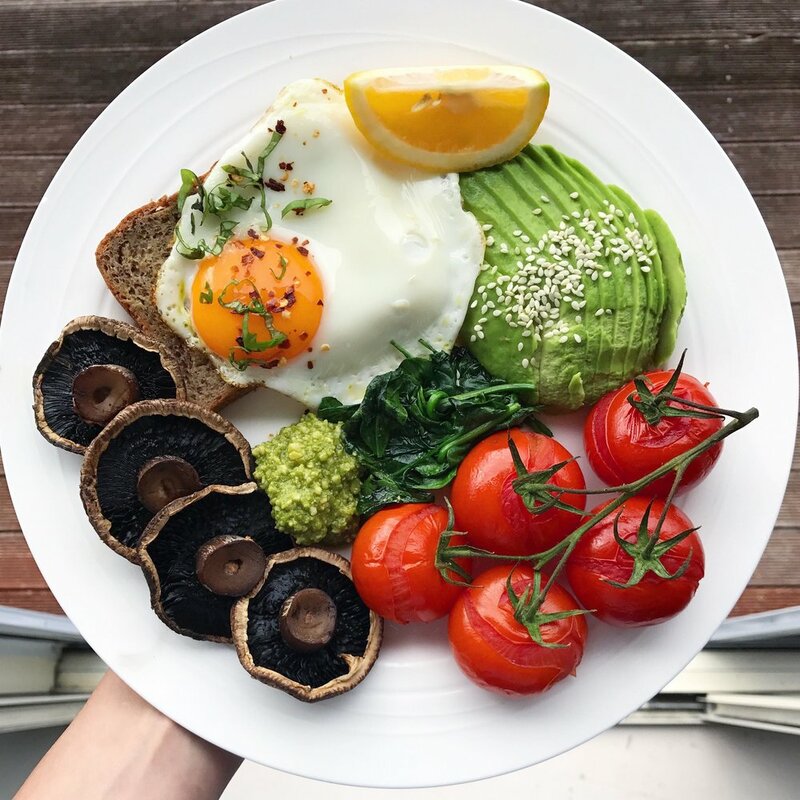 Try and step away from the colourful breakfast food aisle at the supermarket, and aim to base this meal around whole foods instead - these are foods that aren't processed or have been as minimally processed as possible, and are naturally nutrient-rich. Depending on our health concerns, dietary preferences and exercise levels, some of us may function better eating a lower/higher carbohydrate-containing breakfast, or one that's higher in protein or fat - it's best to trial out different types of foods and see what keeps you feeling steady and satisfied into the morning for the longest. A good protein source is typically key, as they're slow to be digested and help keep us feeling full and satisfied for longer. Some of these ideas may be more suitable for the weekend when you have extra time, while some can be thrown together super speedy in the morning when you're rushing out the door. Go with whatever works for you! If you're short on time in the AM, try whipping up a batch of frittata muffins the night before and enjoy a few on the way to work - here's my recipe. These tomatoey baked eggs and bean combination will keep you fuelled for hours into the morning. Basic recipe: add 1/3 cup oats + 1 cup of liquid (water, milk, coconut water) over a stove top, heat on high until boiling, reduce to a simmer, then continue stirring until nice and thick (2-5 minutes). Remove from heat, add toppings and enjoy. Protein oats: add 1/2 scoop of protein powder to the basic recipe after cooking - you may need to add a little more water. Banana and peanut butter porridge: in my opinion this is the tastiest way to eat oats - here is the recipe. A really nutritious breakfast option, yoghurt bowls are equally yummy, as they are easy to put together. Simply add to a bowl 1-2 fruits (seasonal is best), about 1/2 cup thick creamy yoghurt, a small handful of nuts (e.g. almonds, walnuts), a few tbsp seeds (e.g. sunflower, pumpkin or linseed) and a sprinkle of cinnamon or tsp of honey. A good source of protein and probiotics (good bugs for our gut!) from the yoghurt, disease-fighting antioxidants from the berries, and anti-inflammatory fats, and vitamins and minerals from the nuts and seeds. A quick and easy option for when you're short on time. Smoothies travel well, and can be blended up the night before and taken on the road with you in the morning in a travel cup/mason jar. For a balanced smoothie aim to include a carb-rich food (e.g. 1/2 cup frozen berries or a banana), a fat-rich food (e.g. nuts, nut butter, seeds, avocado, coconut or flaxseed oil) and a protein-rich food source (e.g. plain yoghurt, protein powder or collagen). To prepare simply fill a wrap with scrambled egg, sautéed veggies, grated cheese and a little salsa or chopped avocado (if it tickles your fancy). Making and eating one of these will leave you feeling totally chuffed with yourself into the morning. Lets paaaar-tay! I love a full breakfast, although sometimes the traditional dish leaves me feeling a bit 'greasy' post-feasting. Instead try incorporating more veggies into the mix, like grilled mushrooms and tomatoes, sautéed spinach and eggs cooked your way. A great way to get in nutrient-rich veggies in the morning, as well as quality carbs (add some toast or fruit), protein and fat (spread that toast with avocado/pestp/butter - yum!). Tick, tick, tick! Chia seeds are very nutritious - they're rich in antioxidants, and are a great source of fibre, which absorb the liquid their suspended in, making them swell to around 10-12x their weight, forming a delicious pudding-like texture. Chia pudding layered with fresh fruit, and topped with muesli, nuts and seeds, can serve as a yummy morning breakfast. Mixing the chia seeds with a liquid containing protein powder in the preperation stage will help bump up the protein content of the dish. Here's my recipe for a standard chia pudding. You can't beat homemade pancakes in the morning! My banana oat pancake recipe is my favourite and one of the most popular recipes on this blog - they're quick and easy to whip up, cook well, and only require a few simple cheap pantry ingredients to make - here's the recipe. Good quality nut butter with a sprinkling of seeds. Add some homemade chia jam for PB & jelly toast - recipe here. For a very cafe-style breakfast, select your favourite muesli and pair it with fresh seasonal fruit and yoghurt. When selecting muesli steer clear of processed refined options, and instead aim for a low-sugar/sugar-free muesli, packed with nuts and seeds, as it'll be higher in protein and fat. Better yet, if you have the time, make your own! Select your favourite nuts/seeds, add some wholegrain oats and coconut chips, toss with a little coconut oil, your favourite spices (e.g. cinnamon, ginger), and a pinch of sweetener if desired (e.g. mashed banana/dried fruit/maple syrup/honey), and bake in the oven until toasted. My picks for yoghurt are unsweetened full-fat yoghurt or coconut yoghurt. 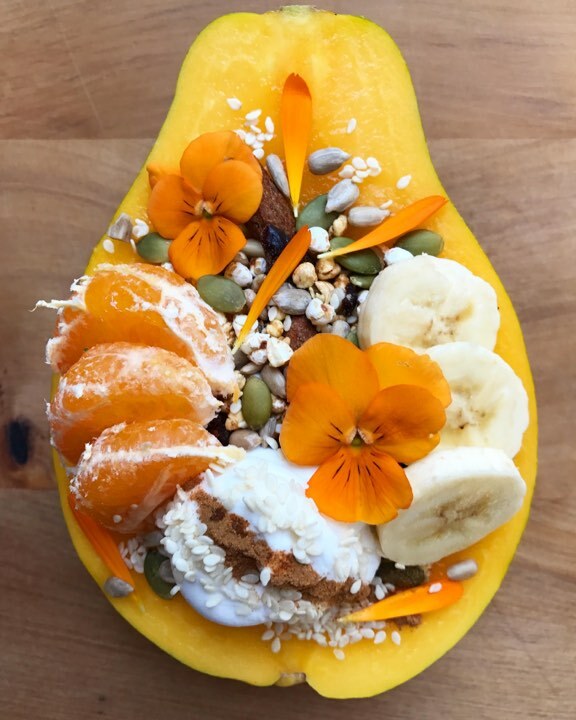 Simply slice a papaya in halve, spoon out and discard the black seeds, and then fill with yoghurt, a sprinkling of nuts and seeds, and a few tbsp of muesli. One is lovely to enjoy in the warmer summer months. The prettiest breakfast to ever exist.Here's my recipe.